Hopefully, the answer isn’t “I use the same password for everything” – that would bring a tear to my eye!! It seems like every website you go to now wants you to create an account. And that means you need to decide what password to use. Many people get in the habit of just using the same username and password for every site. And why is that? Well, convenience, of course! Why not use one password for all sites so you always remember it? Here’s why – if that password is ever compromised, the person with the password now has the potential to log into every single website that you do! Think about this for a minute. This could be email accounts such as Yahoo! or Gmail, bank or credit card websites, shopping websites like Amazon.com or eBay, or social websites like Facebook or MySpace. Really think about this – do you want someone to basically steal your identity just because it was convenient for you to throw security out the window and only remember one password?! Well, I’ve got some good news for you. I currently have over 450 user accounts and passwords and guess what… I don’t think one of them is even remotely close to being the same. And the best part is that I only need to remember one password. The trick is to use a password manager. Additionally, some of the software even lets you set an expiration date if desired or the ability to categorize the accounts into groups (such as Banking, Email, etc.). So, you can have all your information in a single file that you can back up and you can have different passwords for all accounts. And since you now only need to remember one master password to open it all, you should make it a very strong one composed of capital and lowercase letters, numbers, special symbols, and six characters long at the very minimum. Once you start typing it enough, it will be a cakewalk – I promise! Without this password, the file with all the passwords sits encrypted. And because you don’t need to remember the password for the account, you can now make it more than your dogs name. In fact, most password management software will provide the ability to auto-generate some complex passwords for sites that no one could guess… and you don’t even need to remember any of them! How much would you pay for this peace of mind? Ten thousand dollars??!!! Fifty thousand dollars??!!! Well, guess what – you can actually get some of this software for as low as FREE!! That’s right – free! 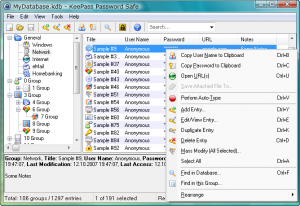 KeePass is open source software. That means that if you are a developer, you can get the actual code behind it to see exactly how it works. That allows people from around the world to contribute fixes and improvements to the software. There are currently two versions of this software – the 1.x version and the 2.x version. The 2.x version is still in beta. Normally I’m pretty excited about getting in on beta software, but when I’m dealing with all my passwords – not so much. I’ve been using the stable 1.x version and it’s great. It’s lightweight and fast. There are keyboards shortcuts you can use to quickly open the software and auto fill in usernames and passwords. There are plugins that are available to do different things (integrate with Internet Explorer or Firefox, importers, exporters, etc.). There’s even a mobile version of the program. I have a Windows Mobile phone and I set it up so my passwords sync to my phone anytime I connect up my phone to laptop. And remember your passwords are in an encrypted file, so with a strong master password, they are as secure as you can get. Importing and exporting. Even without the plugins, you can easily import in passwords from other programs (provided they let you export them out!). And think exit strategy – if down the line you want to move to other software, you can export your passwords out from this software (no additional cost). It lets you export out to several different formats as well. If you’re a fan of grouping passwords into different groups (Banking, Email, etc. ), you can easily do that as well. But you don’t have to – I don’t feel the need for that with mine, so I just don’t use that feature. There’s a portable version. Do you need to have easy access to your passwords on a USB drive… done! There is a version of the program that does not require installation so you can put it on a USB drive with your password file. Did I mention it’s free???!!! 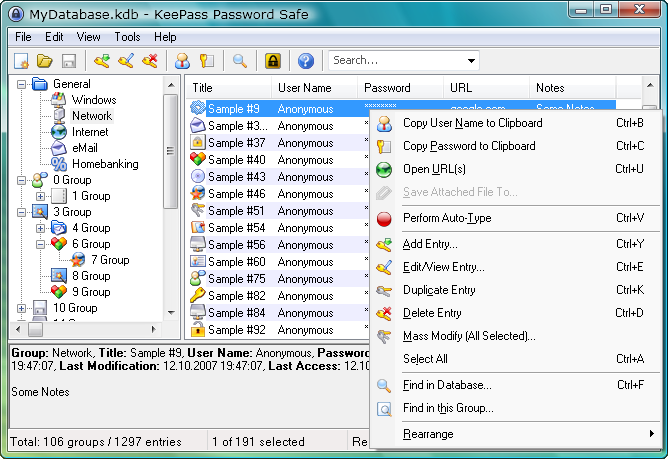 Of the software above, I would highly recommend using KeePass. It’s fast. It’s easy. It’s open-source. It’s flexible in the options and plugins available. It’s secure. It’s portable. And it’s free! If you like it and stick with it, they do, however, let you donate to help support the project, and I highly recommend that you send them something. Every penny counts when you’re dealing with free software – give the developers incentive to continue to make the software even better and want to keep it free! If you are using the “password manager” built into Internet Explorer, you should re-read this post and quickly find a password manager that suits you. I discuss in Just the Computer Essentials some of the problems with Internet Explorer’s password keeping, such as weak encryption, no easy way to routinely back up your passwords, etc. There are tons of other passwords manager programs out there. Check them out and find one that works well for you. Just because I’m a big fan of KeePass and the others above, doesn’t mean there aren’t programs that might be better for you. Many people are fans of RoboForm or Password Safe – find out the one that works best for you! Almost all password managers store all your passwords in a single, encrypted file. Find out what file this is and MAKE SURE TO BACK IT UP!!!! In my book, Just the Computer Essentials, I discuss the importance of backups and even take you through the process of determining what you need to backup and how you should back it up. If you are not doing backups on your computer, get this book! You will learn what you need to know to make sure that you are protected from problems in the future. Check it out at https://www.booksbyjim.com. Also available from Amazon.com, Buy.com, BarnesAndNoble.com, or any online bookstore. MCITP, MCSE, CCSP, CCEA, Server+, A+, and more! 5 Responses to "How Do You Manage All Your Passwords????" Alternatively you can try PasswordsPro (http://www.passwordspro.com). It also run from a pen drive, and not need complicated installation. Permit store passwords but also text notes of any size. We are offering free licenses to bloggers interested in try it and post some note about. How do you feel about the password manager built into Firefox? It’s the same concept…you log into Firefox with a master password and it saves all of your usernames and passwords for all of the sites that you access. The best part is it’s free 🙂 I’m just wondering how the security measures up to the others that you mentioned. Don’t know if you are asking to me or to the blogger, but in any case….PasswordsPro permit also to store text notes and other sort of information, not only passwords. About the free feature, well, having a paid service help you have support any time you need it. First, I don’t think the security to protect them is very good. Anyone with physical access to the computer can easily read all your passwords. I discuss the Internet Explorer issue in my book “Just the Computer Essentials.” In Firefox, there are other ways to gain access to those passwords. David Stoker discusses this at http://www.davidstoker.org/blog/2009/03/21/firefox-password-hacking/ in his blog. Second, they’re not portable or as easy to backup as other password managers. If you get a new computer, some work is involved to move the passwords to your new computer. If your computer crashes, do you have your password file being backed up – this is some work for most users to know what and how to back up this information (or to restore it!). Third, they’re not as flexible. Let’s say you want to add a note to say “this account uses my work address” or anything else. The built-in browser password managers don’t allow you to do this. Roboform. I’ve tried others, but this browser toolbar beats them all. With one click you can browse to a page, login and click submit. Very secure so credit cards can be saved in it also. I use it for testing online software as you can use it to automatically complete long forms.